This expert, unbiased buying guide will help you chooses the right dehumidifier for your home. Includes information on solving humidity problems and selecting between portable and whole-house dehumidifiers. If your home is stuffy or musty, and water condenses on windows and pipes, it is showing signs of humidity levels that are too high. Showering, running a washing machine or dishwasher, cooking—all of these activities put moisture into the air, which can be problematic, especially if you live in a climate where humidity levels are already uncomfortably high. Balanced humidity inside a house is important not only for your family’s optimal health and comfort but also for the house itself. When the humidity level—the amount of water vapor in the air—rises too high or drops too low, a variety of problems can develop. 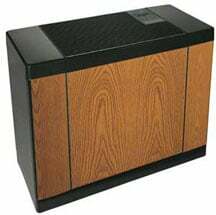 This article is about dealing with high humidity; for information on handling low humidity, please see Humidifiers. High humidity can be a problem during both winter and summer. During winter, the first sign of overly humid air is condensation forming on the inner surfaces of windows, encouraging mold and mildew. Though this normally isn’t a serious problem, the same condensation may collect on the inner surfaces of exterior walls unless the walls are fitted with a proper vapor retarder. This can rot the structure and ruin insulation. Peeling, blistering, or cracking paint on siding—especially if bare siding is visible in spots—usually indicates this condition. Sometimes humidity can be reduced to an acceptable level simply by using kitchen and bathroom exhaust fans. Other methods include making sure the clothes dryer is vented outdoors (for safety, a gas dryer absolutely should be! ), keeping showers short, and running only full loads in washing machines and dishwashers. Also eliminate sources of leaks or standing water in the basement or crawlspace. But when you’ve tried these measures and they’re not enough, it’s time to turn to mechanical assistance. On sultry summer days, when indoor humidity rises above the comfort range, the easiest way to solve high humidity is to turn on air conditioners. Then again, if your home isn’t equipped with AC or the weather is too cold for AC, a dehumidifier may be necessary for drying the air. Dehumidifiers are a practical and easy solution for reducing high humidity levels. A dehumidifier is a relatively simple appliance that is designed to extract excess moisture from indoor air, making interior spaces far more comfortable and healthy for occupants. When buying a new dehumidifier, the first decision is the size of the unit needed. For significant, perennial issues of high humidity, you may want to opt for a central whole-house dehumidifier that uses your home’s heating-and-cooling system to reduce the humidity throughout your entire house. Then again, if high humidity is only periodic and in localized areas of your house, such as a basement, a portable dehumidifier that serves a single area will do the job. After choosing the size of unit, you’ll need to select a technology—dehumidifiers use any of several principles for removing moisture from air. For more about this, please see How a Dehumidifier Works. Portable dehumidifiers, which you simply plug in, are the most popular models for homes that have just periodic, localized issues with moisture. They are available at big box hardware stores and major home improvement centers. 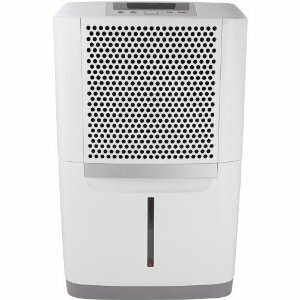 Advances in technology have made these dehumidifiers easy to use, affordable, and effective at improving a home’s air quality. The goal is to choose one that s efficient and effective at reducing indoor humidity and keeping it at optimal levels. Portable dehumidifiers differ in a variety of ways. Following are some suggestions for choosing one that will function optimally in your home. Pick a dehumidifier to fit the space where it will operate. To get a properly sized dehumidifier, you need to know the square footage of the room you want to dehumidify and have a general idea of the area’s moisture levels. A dehumidifier’s drying capacity is measured by how many pints of water it can remove from the air in 24 hours. The Association of Home Appliance Manufacturers (AHAM) sets the standards for sizing dehumidifiers to match a homeowner’s needs. Most manufacturers print an easy-to-follow sizing chart on the packaging of their dehumidifiers to help you pick the right size for the space. If you do not see a sizing chart with the model you are considering buying, ask a sales clerk for the AHAM Selection Guide. You are better off buying a higher capacity dehumidifier than a unit that is too small. Smaller units may run continuously without bringing the humidity down to optimal levels. Higher capacity humidifiers also can handle spaces that may be excessively damp from clothes dryers or dishwashers, which add moisture to the air. Also, if the outdoor climate is humid, it will increase indoor humidity levels. If you live in a humid region, you may want to choose a higher capacity dehumidifier than what the square footage of the room indicates. Choose a humidifier with automated controls for monitoring and setting relative humidity levels. The optimal relative humidity in a home should be between 40% and 50% in summer and 30% and 50% in winter. Dehumidifiers with built-in hygrometers measure relative humidity and display the number. 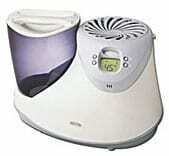 An adjustable humidistat allows you to dial a desired humidity level and the unit will automatically maintain it. If the dehumidifier you choose does not have these settings, you may want to invest in a hygrometer to hang next to the dehumidifier. The device ranges in price from $10 to $60 and will measure the indoor humidity so you know when to switch the unit on and off. Consider the unit’s bucket size. Dehumidifiers with larger tubs or drip pans need to be emptied less often. But expect to pay a little more for the convenience. A rule of thumb is that the more water a dehumidifier can extract and hold, the more it is likely to cost. Shop around because prices can vary. Expect to pay about $140 for a 25-pint dehumidifier and $225 for a 70-pint dehumidifier. Dehumidifiers with front-loading buckets are easiest to empty. Most portable dehumidifiers are equipped to be self-draining and come with a drain-hose connection. But the dehumidifier will need to be placed in an area where the hose can empty water, such as into a basement floor drain or a laundry room sink. Opt for a dehumidifier that can function at low temperatures. Unless you live in a climate that is warm year-round, consider a unit with an automatic defrost feature. The heat-exchange coils on a dehumidifier can frost over when indoor temperatures drop below 65 to 60 degrees F. so look for a unit that is Energy Star certified to 45 to 40 degrees. Although you may pay a little more for the automatic defrost feature, it will spare you the expense of replacing a unit damaged from iced coils. Noise can be a nuisance, especially if the dehumidifier is in or near a bedroom. Dehumidifiers with two-speed fans run quietly at lower humidity levels. They also save on energy costs. It’s not a bad idea to test a dehumidifier’s noise level before you make your purchase. Make sure your new dehumidifier comes with casters so it can be rolled from room to room. A long power cord will enable you to put the unit anywhere you want it. An overflow protection valve will cause the unit to switch off when the tub is full and needs to be emptied. This is a key feature to have on any model you choose. Some dehumidifiers have indicator lights to show when the bucket is full. Dehumidifiers that carry the Energy Star label will save money on utility bills. Dehumidifiers certified with the government-sponsored label are guaranteed to use less energy yet run efficiently. Some models have filters that protect the coils from dirt and dust. Make sure you can easily remove the filters and wash them, a task you should do about twice a month. This will allow you to replace the filters less often. Whole house dehumidifiers are the most expensive models, costing between $1,000 and $2,000. They typically are fixed units professionally installed and connected to existing ductwork in a home’s central air or heating system (often right at the furnace or air-handler cabinet). There are three common types of home dehumidifiers: heat pump dehumidifiers, chemical absorbent dehumidifiers, and dehumidifying ventilators. Each has its advantages and disadvantages. 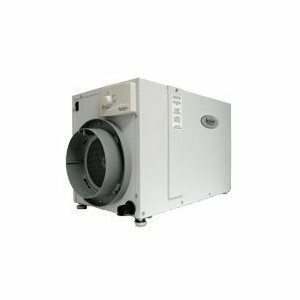 Heat pump dehumidifiers extract water from the air by using a heat pump that is similar to an air conditioner pump. First, a fan pulls the indoor air across a very cold coil, which causes the moisture to condense. The droplets drip into a bucket inside the unit or are pumped to a drain through a hose. The dry air is warmed by a second, heated coil and exhausted at room temperature. These dehumidifiers are considered among the most effective. Chemical absorbent dehumidifiers work best in warm climates. They use a chemical drying agent, or desiccant, on a heat exchange wheel to absorb water molecules from the air. Damp air is sent outside via vents. Desiccant dehumidifiers use a lot of energy. They are more commonly used by industries than homeowners. Dehumidifying ventilators have a sensor controller and exhaust fan. The sensor controller activates the unit when humidity reaches a specified level. Dehumidifying ventilators are less effective in muggy climates because they draw outside air into the house. These dehumidifiers often are used in basements. But they can depressurize a room and cause gas spillage. Make sure gas furnaces are properly vented.